“The Truth About Forever” by Sarah Dessen | Mel Reads YA! My boundless love for Sarah Dessen … well, it knows no bounds. 😉 Sarah is my absolute go-to author for pitch perfect depictions of girl friendship, first love, and magical summers. Check out the Sarah Dessen tag below, because I’m a fangirl, y’all, and have read, cherished, and reviewed quite a few of her books. I mentioned in my previous entry that I was beaching it recently, and beach reading basically REQUIRES a healthy dose of Sarah Dessen. Hence, me, sand, the waves, an umbrella (I’m slightly vampiric! ), and Sarah’s 2004 gem, “The Truth About Forever.” What a perfect combination. Teen girl Macy recently (and quite unexpectedly) lost her dad to a fatal heart attack. Older sister Caroline is married and out of the house, mom is an uptight, driven mess, and boyfriend Jason is rigidly focused on his academic future. When Jason heads off to “brain camp” for the summer, Macy finds herself alone with a stack of SAT textbooks and a mind numblingly boring gig at her local library’s reference desk. [Which, no comment!] Macy stumbles upon Wish, a local catering company, at one of her mom’s events. The Wish folks, led by the pregnant and perpetually frazzled mother hen Delia, are a fun, quirky family. Their obvious warmth and affection for each other — as well as their ability to get the job done, even when things inevitably go awry — immediately appeals to Macy. On impulse, she joins the crew and starts working events, despite her mother’s obvious disapproval. So, yeah, there’s a GUY on the Wish crew. Duh. His name is Wes, and he’s a reformed bad boy who makes these epic angel and heart-in-hand sculptures out of wire, sea glass, and other scavenged materials. He’s deep and dreamy, and you will love him instantly. Trust me. Wes and Macy somehow jump into a continuous game of Truth or Dare, played out over many long nights, in which each slowly reveals details about their lives, hopes, and issues. Basically, they fall for each other without ever really admitting it to themselves. You’ll dig it. Again, trust me! Plus, he creates some art for her. Swoon. There are, of course, complications. Macy’s mom isn’t too keen on the Wish folks, who also include sci fi nerd (and Wes’ younger brother) Bert; the scarred but completely adorable Kristy; and the mostly monosyllabic Monica. Mom, who buries her grief in a frenzied workload, eventually isolates Macy from the crew, which seemed a bit unrealistic to me. Macy gave up her entire life following her dad’s death, including treasured friendships, teenage silliness, and her most beloved activity, running. You’d think mom would like to see a little sparkle back in her daughter’s life. Complications also arise between Wes and Macy, as each remains on guard despite their attraction. When Macy spots Wes at a late night hangout with an old flame, she cuts him off and retreats back into her old, lonely ways. But try as she might, now that Macy has rediscovered life, she can’t quite cram herself back into her spare, constricted little world. After a long summer of talks, parties, laughs, and tears, Macy is left with a tough decision: continue to play it safe with Jason and the SATs, or move forward, dive in, and take all the pain that comes with being truly alive. Sarah is an incredibly beautiful writer, and “The Truth About Forever” is chock full of her usual lyrical passages, quietly heartfelt moments, and loving characterizations. She perfectly captures the heady combination of sky-high joy and crushing fear that accompany falling in love, making us understand exactly why Macy runs from Wes. Sarah slowly, believably pulls Macy along on her journey, nailing that end of the movie, they finally get together moment. It’s so understated and charming that you get the payoff without feeling cheap about it. You know what I mean! 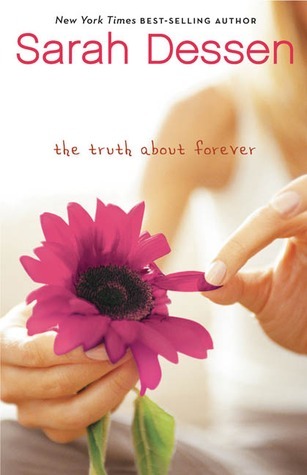 Throw in empowering girl friendships and some exquisitely rendered mother-daughter scenes at novel’s end, and “The Truth About Forever” is an absolute winner. Summer or not, you older middle school (and up!) readers will adore this one. In case you’re like me and somehow overlooked “The Truth About Forever,” please get on that now asap. Even though summer is over, there is always a place for a summer book. Happy reading! PS ~ Cute fan-created book trailer below. Check it out!